For the love of all that is holy, get thee to an Indian grocery store and buy yourself some red chutney powder (don’t worry, I’ll explain more about that later). It’s time to make the best batch of popcorn of. Your. Life. Of or relating to the pantheon. I don’t know what compelled my friend Lea to combine these ingredients, but I sure am glad she did, and that she logged on to tell the world! 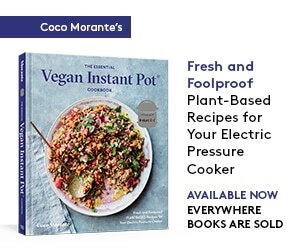 * There really is something special about musicians who love to cook — often, our brains work in off-the-wall, creative ways, making connections between disparate ingredients to come up with new and wonderful things to eat. If you’ve never had chutney powder before, you are in for a pungent, flavorful treat! A mix of ground black lentils, dried chili peppers and spices, it’s traditionally combined with sesame oil or ghee and used as a dip for idli and dosai. The MTR brand is widely available — you can find it in most Indian grocery stores, or order it online if you don’t have one in your area. 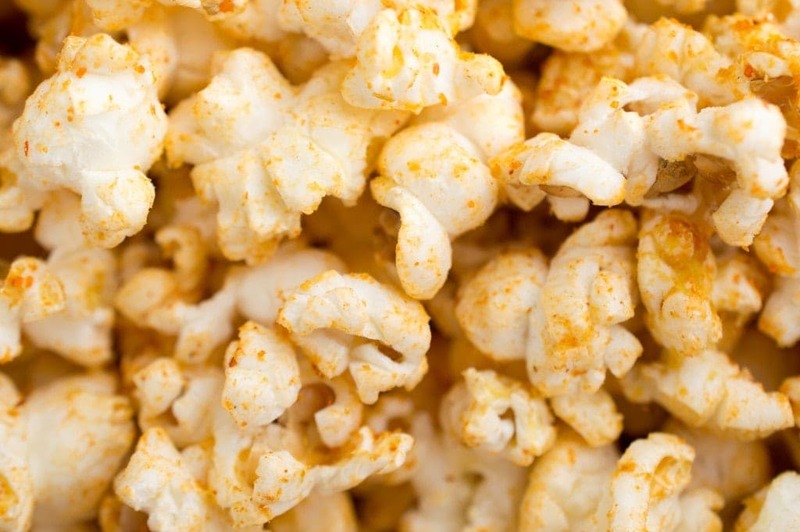 You’ll also need a couple tablespoons of ghee to cook your popcorn. You can buy a jar at the Indian grocery store while you’re picking up that chutney powder, but it’s easy to make a batch at home if you’d rather go the DIY route. 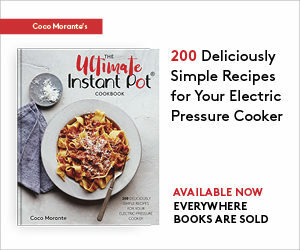 This tutorial from The Healthy Foodie is a fantastic guide, with pictures of every step of the process. She uses organic unsalted butter, simmering out the milk solids and letting them caramelize before straining the finished product. I made a half-batch, but I really should have used the whole pound of butter and gone for it. This stuff is liquid gold. Now, let’s leave India and take a trip to Hippietown, where you’ll find the rest of the ingredients required to make this incredible snack. 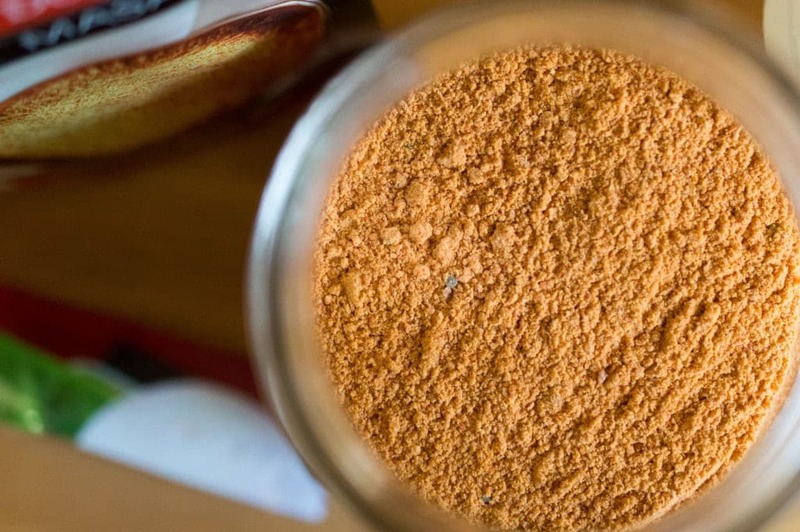 You’ve heard of nutritional yeast before, right? That yellow, flaky stuff you can buy in the bulk bin aisle at Whole Foods? In Santa Cruz, where I went to college, the locally-owned movie theaters had huge shakers of nooch for sprinkling onto your popcorn. 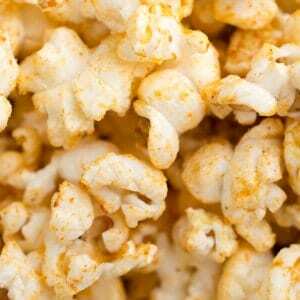 The nutritional yeast imparts a coating of hyper-umami flavor, making the popcorn utterly irresistible. Today, I used blue popcorn, because that’s what I had on hand. Run-of-the-mill yellow kernels will work equally well. 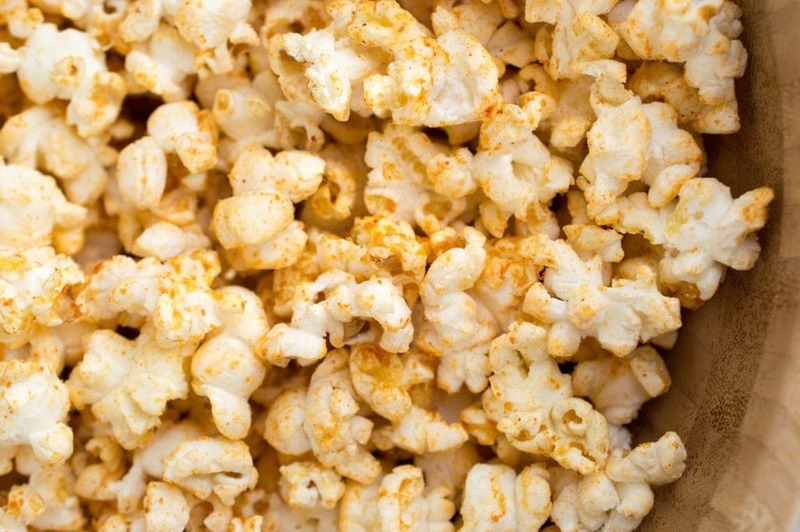 Popped in a generous amount of rich, aromatic ghee, then tossed with nutritional yeast, chutney powder, and a drizzle of extra virgin olive oil, this is hands down the best popcorn I have ever eaten. Let’s all thank Lea for sharing and dig in! *Update: As it turns out, Lea’s friend Alanna was the one to suggest topping popcorn with red chutney powder. Another foodie/musician, you can find her recipes on her blog, The Bojon Gourmet. Indian-Hippie fusion cuisine at its finest. 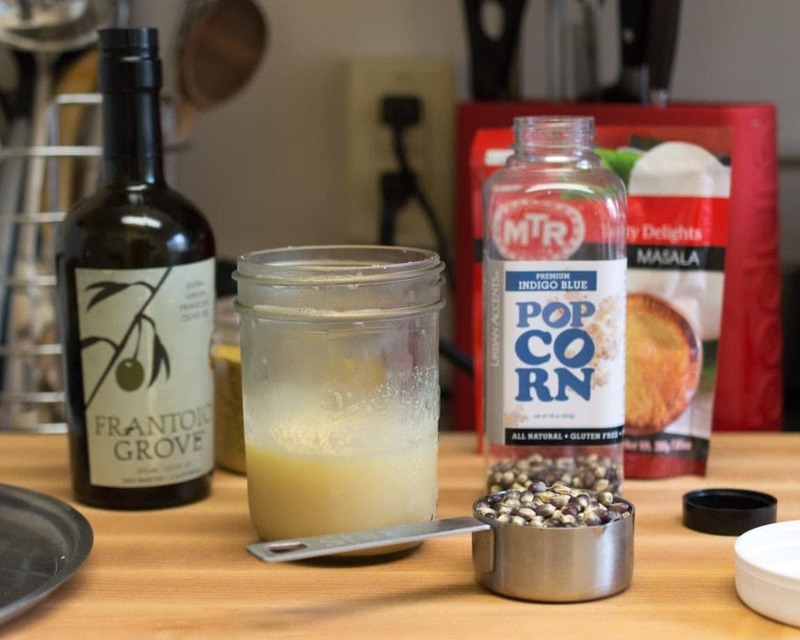 Popcorn is popped on the stovetop in ghee, then tossed with chutney powder, nutritional yeast, and extra virgin olive oil. In a medium (3-quart) saucepan, melt the ghee over medium-high heat. Add the popcorn to the ghee and cover. Shake the pan occasionally until you begin to hear popping sounds. 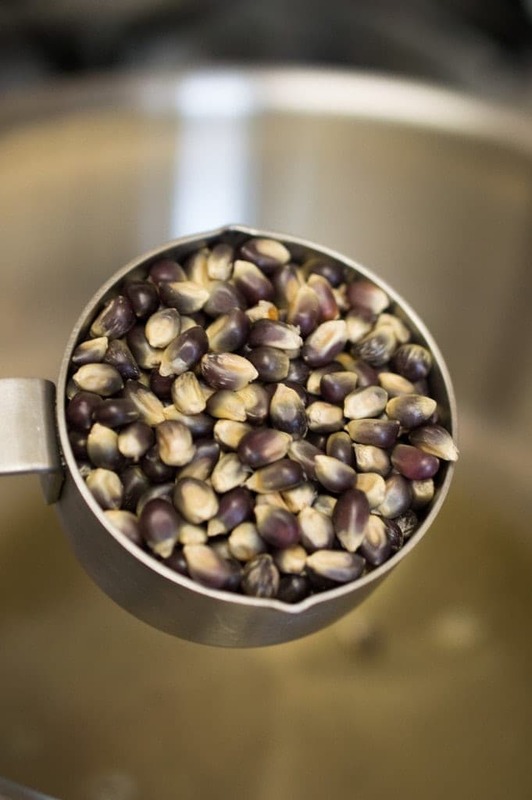 While the corn is popping, shake the pan every few sew seconds to make sure the popcorn doesn't burn and all of the kernels have a chance to pop. When the popping sound reduces to once every two or three seconds, remove the pan from the heat and transfer the popcorn to a large serving bowl. 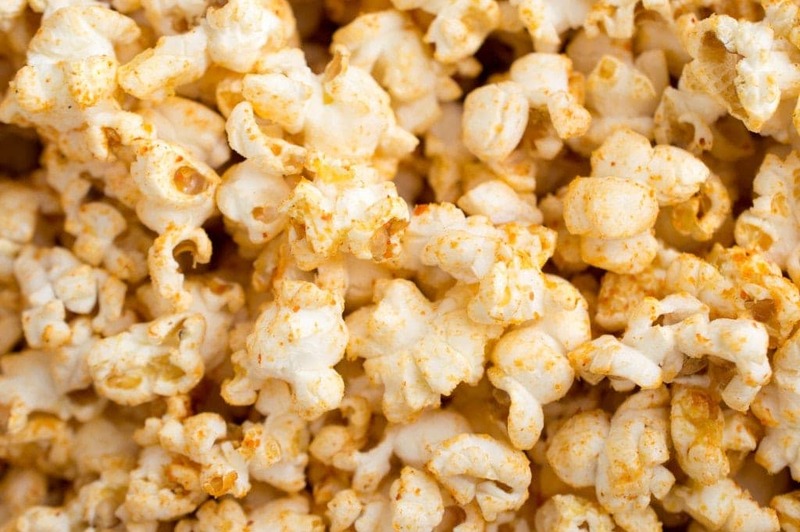 While the popcorn is hot, sprinkle in the nutritional yeast and chutney powder, and drizzle the olive oil over the top. Toss to combine and serve immediately.